Map Kibera fields all sorts of data questions from the net and in the community. We’re happy to oblige, our core mission is to openly share and distribute information about the slums, by slum dwellers, for slum dwellers. We also want to share those questions and answers and progress, to show the community of folks who really care about, create, and use this data. This is eventually going to build into thematic sections on a new website, but for the time being, this blog post. We received two queries from Poverty Action. In context of their other evaluation work in Kenya, they are scoping a study of early childhood education in African slums. If you have more information on any of these questions, would be great to hear about it in the comments. What kind of education data is available for Kibera, Mathare and Mukuru? 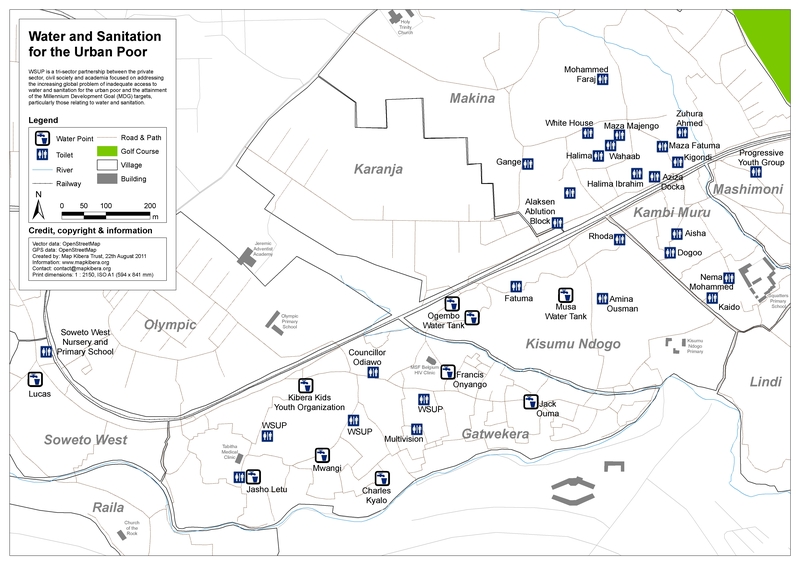 Mappers have collected basic information on schools in all three slums, available for download in Kibera, Mathare, and Mukuru. In Kibera, much more detailed data has been collected, on the number of staff, students, status of the facility, programs. That was collected as part of the mapping themes process in 2010, which included meeting with community stakeholders, design of survey, and data collection. Mathare was collected in 2011, and Mukuru in 2012, but in less detail. The CSV files have the most detail. 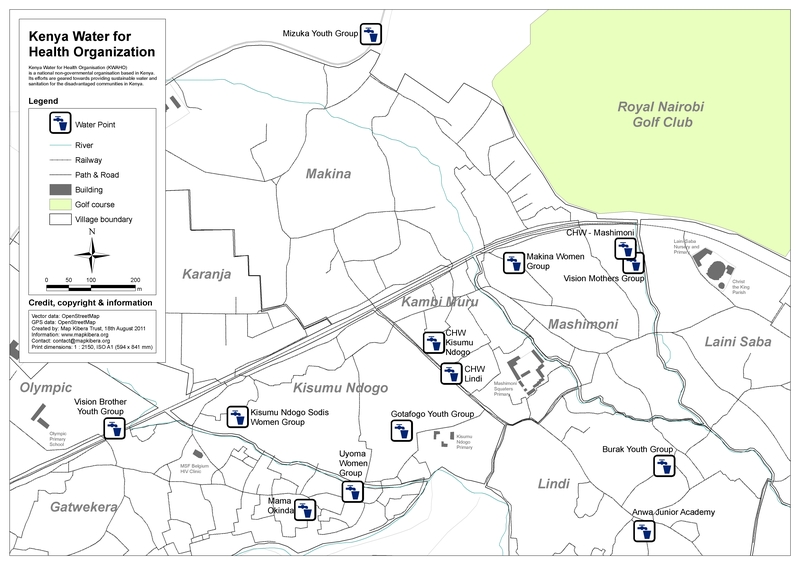 There are also print maps prepared for Kibera and Mukuru. Have there been recent census in the slums? Is data available at the household level? Are enumeration area boundaries available? The last comprehensive census in Kenya was conducted in 2009, and results released in 2010. This made news as the population figures for Kibera differed greatly from the media hype. We wrote about the process and politics of the census back then. As far as we’re aware, there’s been no public census since then. There have definitely been data gathering exercises, surveys, by all kinds of actors, but unfortunately much of this data remains silo’d and unopened. Data from the 2009 census is available at OpenDataKE, but only released aggregated to ward or constituency level. Those boundaries were not released, and were changed by the IEBC prior to last month’s election. I’ve never seen Enumberation Area boundaries released, and am not certain they are digitized. There are a few reports out there on the process, which give some explanation of the methodologies, on the Kenya National Bureau of Statistics website and in a UN Data report. > assisstance in my research. Kindly help me where you can. Otherwise, there is no systematic study on alcholism that we’ve participated in. However, there are some journalist reports collected on http://voiceofkibera.org, you can search there to find a few. Regarding electricity infrastructure, no that has not been collected yet. As you’re likely aware, there’s only partial formal service, and a lot of informal service, which makes for a complicated mapping endeavor. There’s back and forth between the power company and the community, with illegal hookups periodically removed, and then placed back (often by the same employees on the sly). There’s also several solar lighting projects, which are interesting models, but even harder to map. Please, how does Map Kibera collect its data? Here are a few resources to get started. This should start to illustrate specific locations of water points, and give some indication of the different providers. > these institution’s work would be of high value to us. Yes, we have record of two health centers in Soweto West. The other is called Senye Clinic, here’s its location. For good measure, here is the location of Revival Medical Centre. > help. I am looking for a shapefile for suburbs for Nairobi. I am a sociologist who lives in Rocinha, one of Brazil’s largest favelas, and where since 2007 the federal and state governments have invested hundreds of millions of dollars in favela-upgrading and security schemes (approx., 150 million as of mid-2014, with another 750 million planned by 2016). I am curious as to the total amount, in USD, that has been invested in Kibera in the name of slum-upgrading in recent years as well as the names of the programs and any budgetary information available on slum-upgrading in Kibera. I have tried the government/ministry websites of Kenya to no avail, including Kensup, with no luck, they don’t even load. Any help would be greatly appreciated. It’s an excellent question, and we don’t have an immediate answer. But I’ve begun asking colleagues for any leads. Will let you know if anything substantial develops. Most I’ve found through searching is this page, which is fairly comprehensive run down of programmatic activities, but no budgets. Kenya shillings 884 billion (GoK, KENSUP Implementation Strategy, 2005).” Or about 13 billion dollars. That’s projected budget, and nationwide, and for 15 years. So doesn’t answer questions about actual expenditure in Kibera. Found on this page, http://www.treasury.go.ke/index.php/resource-center/cat_view/79-budget-/139-budget-2013, the “Highlights” document does state “Ksh. 200m for construction of 200 prefabricated health care facili-ties in slums”. That sounds pretty different policy direction from past years, with the clearance and decanting, etc. Are you aware of any information more detailed than that, looking at where these health care facilities will be located in detail, and monitoring the implementation? Am also looking for more detail in years past. National budget is helpful, but doesn’t answer specifically how much was invested in Kibera slum clearance projects, for example. > Viwandani and Korogocho in Nairobi. http://mapkibera.org/download/korogocho-kariandundu-villages.zip (this includes more than korogocho, adjacent areas within the bounding box). I am looking to complete a project on the impact of the new link road on Kibera, Where would I be able to find data to map on the area destroyed for the road and where the road is proposed to run. Thanks so much for this, is there any information on the specific area that has been destroyed for the road? You are currently reading Frequently Asked Data at Map Kibera.